We started off with some traditional miso soup to warm us up. A little on the salty side but I liked that there were real pieces of mushrooms inside along with a generous amount of seaweed. The soft shell crab came next, fried to perfection. Crispy and crunchy, the crab had some great flavor especially paired with just a touch of dipping sauce. 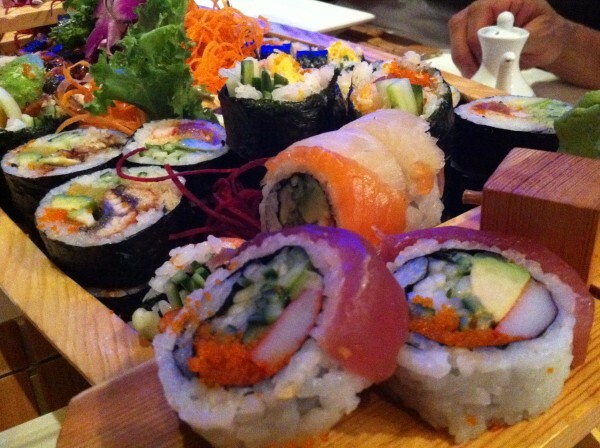 We got a motherload of sushi that floated towards us on a wooden boat – how often do you get those?! Me? Not so much. We got a mixture of yellowtail, hamachi and unagi, your classic rolls of Kamikaze, Rainbow and spicy tuna and a few fried ones including the Tiger Eye (with squid, kanikama, avocado and tempura) and the Casablanca (with strawberry, avocado, cucumber). All in all we had a pretty decent, very filling meal here. Be careful though, the rolls add up and you can accumulate quite a bill in no time. Tags: Acadie, Agedashi Tofu, Dinner, Hamachi, Japanese, Lunch, Marche Centrale, Mikasa, Miso Soup, Rainbow, Salmon, Soft Shell Crab, Spicy Tuna, Sushi, Tuna.